All versions require Steam and Denuvo Anti-Tamper DRM and a constant internet connection for all game modes. Delete or rename StartupUE4.mp4, StartupNvidia.mp4, and CinematicIntroV2.mp4. Configuration data is stored in multiple files at the above locations. Game can be played "offline" on a local single player server or on any given server. Proper Hor+ scaling natively supported. Map is 16:9 image aligned to left of screen. Insert is permanently bound to the development console and cannot be used for other commands. By default acceleration is off. Negative acceleration comes from mouse smoothing. Can be set more precisely and outside in-game limits in "steamapps\common\Conan Exiles\ConanSandbox\Saved\Config\WindowsNoEditor\Input.ini" as AxisConfig=(AxisKeyName="MouseX",AxisProperties=(DeadZone=0.000000,Sensitivity=0.019671,Exponent=1.000000,bInvert=False)). Be sure to only change "Sensitivity" and to also change the value for y-axis. Official servers use BattlEye anti-cheat. 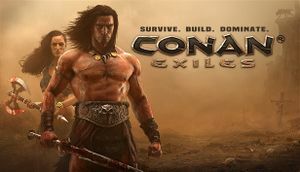 See Helix Mod: Conan Exiles Beta W.I.P..
↑ 2.0 2.1 File/folder structure within this directory reflects the path(s) listed for Windows and/or Steam game data (use Wine regedit to access Windows registry paths). Games with Steam Cloud support may store data in ~/.steam/steam/userdata/<user-id>/440900/ in addition to or instead of this directory. The app ID (440900) may differ in some cases. Treat backslashes as forward slashes. See the glossary page for details. This page was last edited on 1 April 2019, at 05:14.